No… The Word No… The Concept No… The Idea ‘No’ hurt; and for many viscerally. 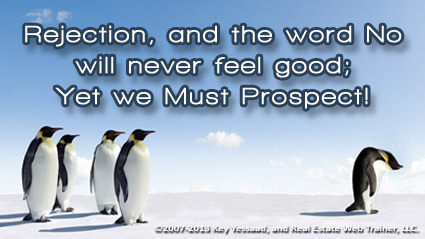 Rejection does not feel good, and many have abandoned Prospecting for new business, because they heard a few forceful No’s and they have internalized them. Emotional rejection will never feel good; but the No’s of someone not listing with you should be placed on a different plane than someone liking you. Human Beings are Social Beings, we may not groom each other by picking fleas from each other hair, but we do seek acceptance and being part of social group. Picking up the phone on someone who will hang up on you hurts; having the door of a Homeowner slammed shut in your face will make you cringe; Being told to never call back or knock on someone's property will feel devastating; yet the business of Real Estate is Prospecting Not Processing Deals. Teach your agents and yourself to handle ‘No’ with class and move on to the next door without any residual feeling, and you will become a successful Listing Agent!